Homeowners Anne Cao and Paul Oulton are expecting thousands when doors open on Waikato Cherry Tree Festival. The Cherry Tree Festival was born from Anne Cao and Paul Oulton's desire to share their garden's beauty. In awe of the flourishing line of cherry blossoms bordering Paul Oulton and Anne Cao's driveway, entranced passers-by found themselves meandering onto the pair's property. On one instance, a couple used the flowering trees as a backdrop for their wedding photos, scurrying away when they saw the homeowners turning down the drive. The actions of these strangers and their adoration for the cherry blossoms, prompted Paul and Anne to establish the Waikato Cherry Tree Festival. Now in its second year, the pair are expecting thousands to gaze upon their manor in Tamahere. 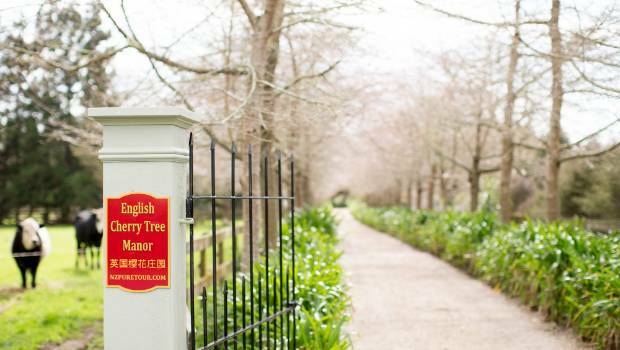 The English Cherry Tree Manor is located in Tamahere and features a 125m driveway (file photo). But Paul and Anne never expected the "accidental" festival to gain so much attention. "We thought we'd get maybe, two or three hundred people and we'd have to do some marketing and spend a bit of money. But all we did was one Facebook post, and in one week, we had 1000 people interested," Paul said. "But the whole Cherry Tree Festival is an accident. No one planned it." When Paul purchased the property around 22 years ago, the land was flat paddock, with "virtually nothing here," he said. Their 1930's house was transported from Auckland in five pieces and sits on five acres of land. The 125m drive was planted with paulownias, and Paul scattered 40 cherry trees in between each one, which made them grow tall and straight and form a canopy. He eventually felled the paulownias, but the cherry trees remained. 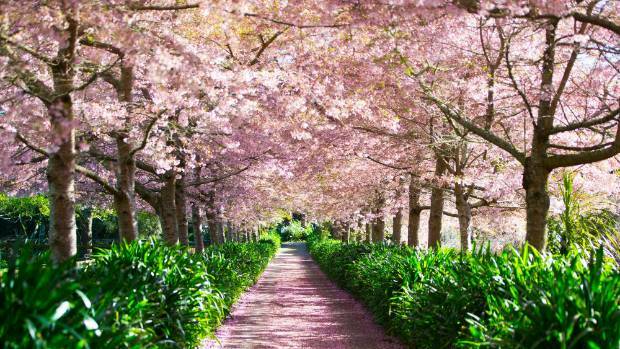 Waikato's first cherry tree festival draws quite the crowd to mark the start of spring (file photo). "It's a hobby that has taken him 22 years," Anne said. "This wasn't a one-day job." But Paul said gardening was something you get addicted to. "When you're stuck in an office on a computer all day, it's nice to be out in the open. You have to be patient, but when you see the results you think, 'wow'." This year's Cherry Tree Festival will feature stilt walkers, human statues, Japanese Wai-Taiko drummers, Kapa Haka, Kung Fu displays and a Chinese dragon. There will also be local artisan food producers, and a scattering of decorative lights around the property. "We really wanted to create a happy, family event for everyone," Anne said. "We've enjoyed bringing the community together; it's a really harmonious feeling." The Waikato Cherry Tree Festival will be held at the English Cherry Tree Manor, 125 Matangi Road, Tamahere, on September 21-23, 8am-8pm. Tickets via: NZ Pure Tour.